Stats: He doesn’t have a doctor’s appointment this month, so I am going to totally guess and say 18 pounds and 26 inches based on his last visit. Favorites: He is the most pleasant right when he wakes up in the morning (definitely a morning baby). He loves fruits and loves to munch on puff cereal. He is really into banging things together and loves to splash in the bathtub! (I feel like I am in the splash zone at Sea World.) He loves his blanket and rubs it on his face all of the time. He isn’t as dependent on his pacifier as he is the blanket, which makes it hard when I have to wash it. He loves to cuddle and be held. Lifesavers for Mom and Dad: Now that he has started to sit up on his own, it is a whole new world of play for him, which is nice. He likes to play with Lego Duplo blocks and a small drum toy. He loves his teething rings and chews on it all day. He is great at night sleeping! Things He Hates: When I take too long to get his food ready. When it’s way past his bed time. I honestly am having a hard time thinking of stuff because he is such a pleasant baby! Facts: Two bottom teeth. Sitting up on his own. Banging and splashing things. Smiling all the time. Babbles a lot in the evening. 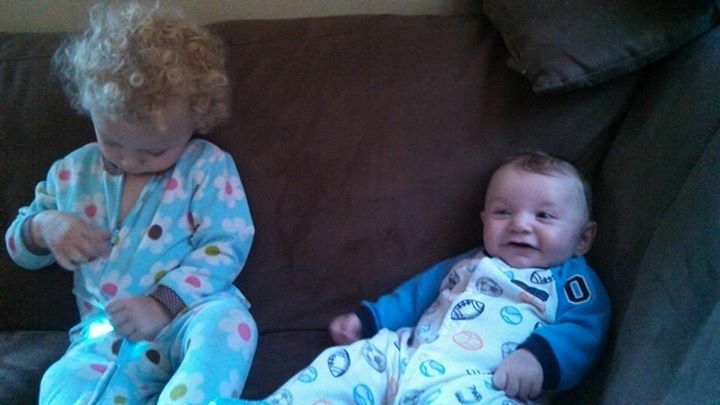 Loves to look at Barney and ADORES his sister. Loves to look at books. He loves to play with blocks a lot and is interested in what Olivia does. Loves to be held by anyone. Loves to sit in his car seat. Has a great sense of humor. Sleep Habits: He does great at night but doesn’t like to nap during the day. I put him down between 7 and 8 and he will sleep until 5. I will feed him and then he goes back to sleep until 8. I don’t count on this happening for the rest of his life so I am soaking it in right now. I really want to train him to nap when Olivia naps, so my life could be easier, but I can’t complain! Doctors Visits: Not until 9 months. Hopefully we don’t get a sick baby! Eating Habits: Eats about six bottles a day…and baby food. 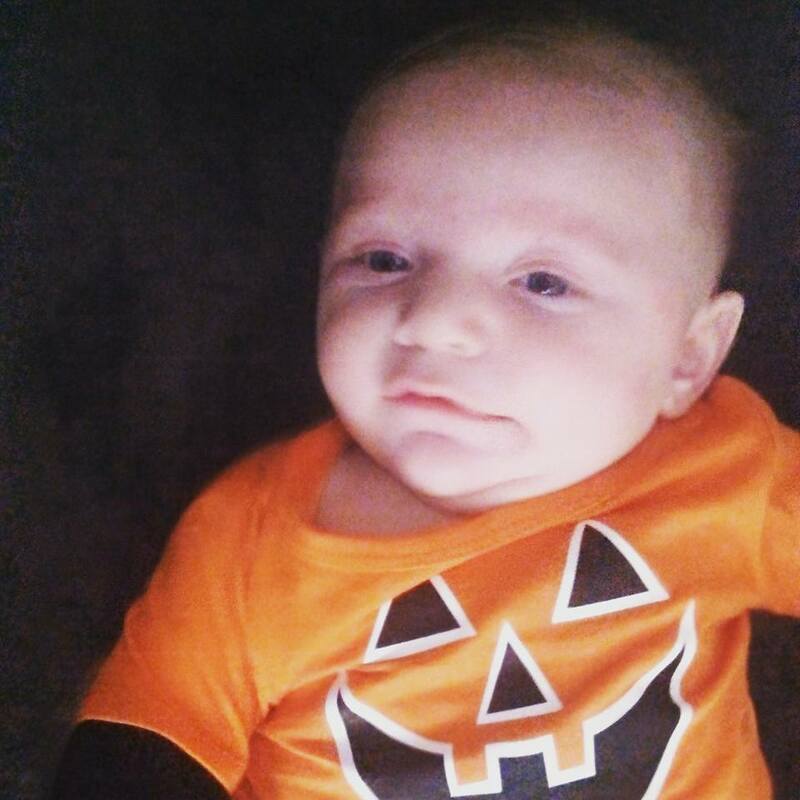 He loves pears, squash, sweet potatoes, and apples. Lifesavers for Mom and Dad: He basically has stations around the house to keep him busy when he is not being held: His kicking piano (which he loves to kick), his jumper, his playpen, his playmat and his high chair. He is so good about playing on his own! He loves to jump! Dislikes: Not being fed fast enough. He’s not a fan of green beans and peas, but he will eat a few bites. Nightime. The bewitching hour is around seven at night. He is ready for bed but fights it a little. Sleep Habits: He falls asleep pretty well, but then wakes up once or twice a night. We are trying to wean him from the night feedings this month. Doctors Visits: He did great at his six month check up and even had to get his shots. 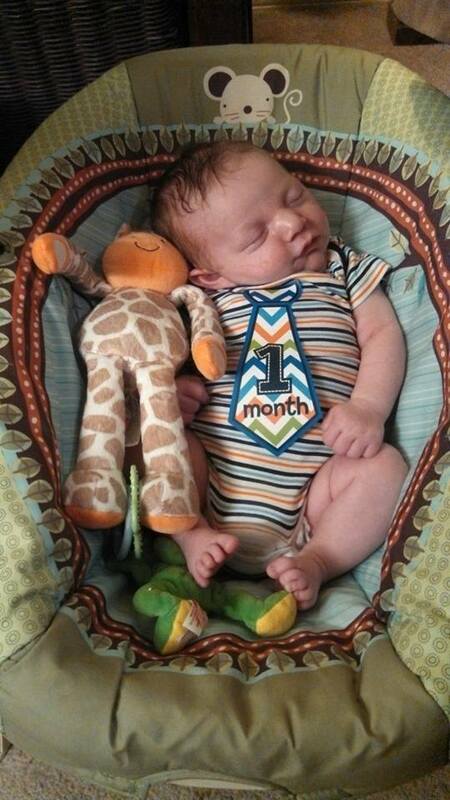 He still had a little cradle cap, that we managed to get rid of this month! He got a pretty bad cold for a couple of weeks that seemed like it would never go away! Eating Habits: He is still eating about six ounces four to five times a day and then baby food two to three times a day. He loves pears, peaches, apples, squash, sweet potatoes, carrots, and bananas. Looking Forward To: Being able to sit him up in a shopping cart and sitting him up to play with toys. Favorites: He LOVES baths! He sits there like he is hot tubbing with his buddies. He loves any kind of interaction with him. He smiles so big when he knows you are paying attention to him. 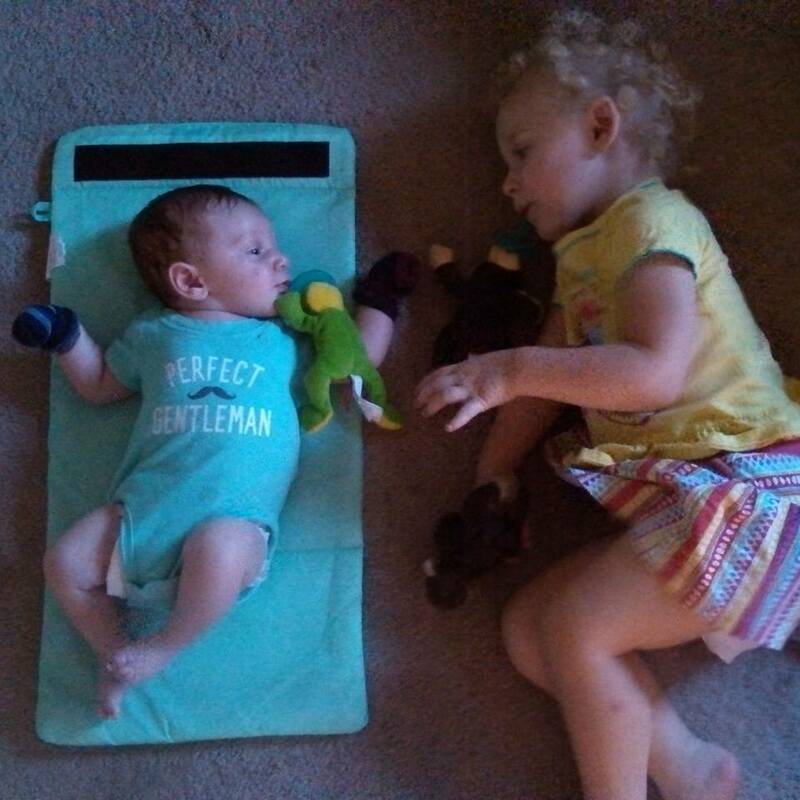 Lifesavers for Mom and Dad: His play mat and his swing. It’s nice to give him activities to do when you have a high maintenance two-year old running around. 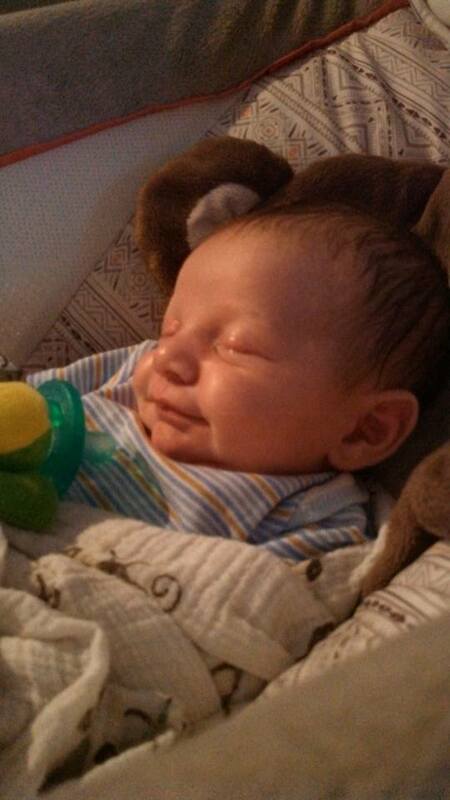 He really is a good baby….for now. I know what is coming and I am not looking forward to it. Dislikes: Again, when I take too long to feed him. 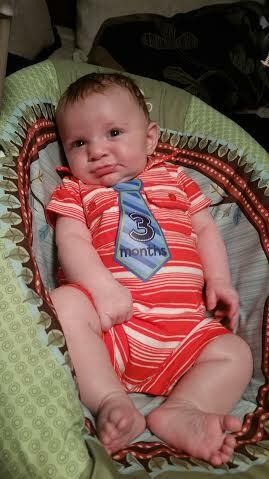 Facts: He is super vocal this month, always screeching and cooing. He is super smiley when you hang with him. We call him “roly poly” because he just wants to roll into a ball. We try to get him to stand and he won’t even attempt it. 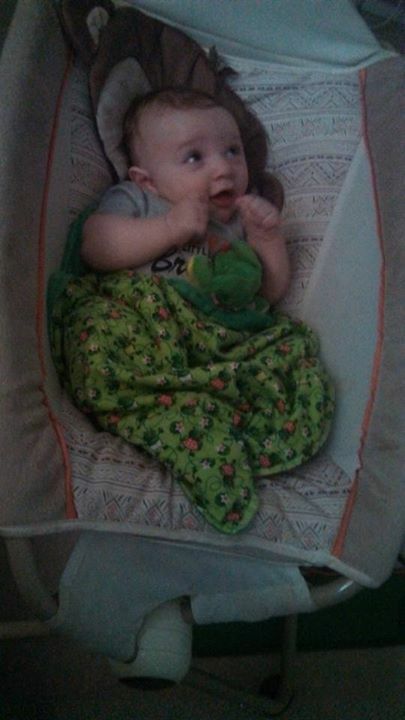 He is starting to get the sitting assisted and is quickly moving towards using the Bumbo. He loves Olivia and loves to coo at her. Sleep Habits: He has about 3-4 naps a day and has started a night routing about half way through this month. He falls asleep around 8 or 9 and then wakes up at 4 to eat and then goes back to sleep. I will take it! Doctors Visits: None this month for him. 4 month appointment is next. Eating Habits: He eats 5 ounces every three hours and then holds off at night until about 3 or 4 in the morning. He has a pretty good schedule going. Looking Forward To: Christmas. He is going to be so dang cute. Favorites: He is pretty good about sleeping. He is more alert at night, which will be fun when I start sleep training him. He likes it when I put his rock and play by the back window so he can look out. He is loving his swing. Lifesavers for Mom and Dad: His swing. 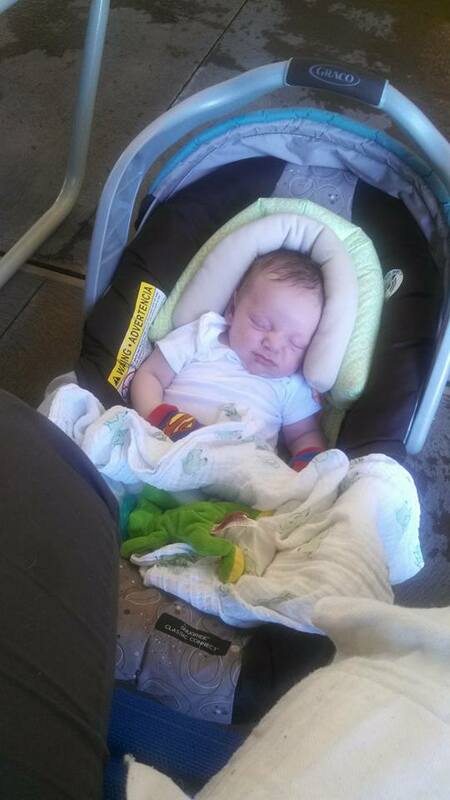 Right after I feed him at night, he usually will go right back to sleep if I put him in the swing. Also, his rock and play is nice to move around the house when I am doing activities with Olivia and housework. Dislikes: He absolutely hates baths and screams when I do it. He also screams when I put him in the car seat, but usually settles down after a few minutes and then sleeps the whole time. Doctors Visits: He went in a few days after birth, one week out, and then two weeks out (he had lost a lot of weight), and then for his monthly check up. I feel like I have been at the doctor’s office a lot. It’s cool to see his charts and his growth. Eating Habits: Since he was losing weight, I had to supplement and let’s just say that it definitely helped. He eats A LOT…about every 2 to three hours and doesn’t take any breaks. 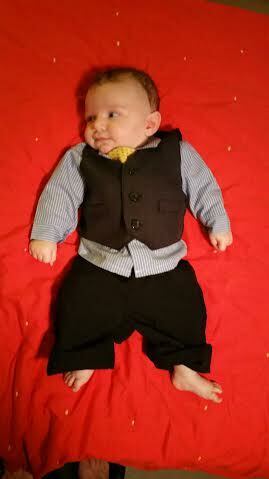 He also went from 50th percentile to 75th percentile in weight because he is such a piggy. Milestones: Pretty much just keeping him alive and giving us eye contact. He is so good at lifting his head and swings it around a lot! Looking Forward To: Seeing him smile and interact more! 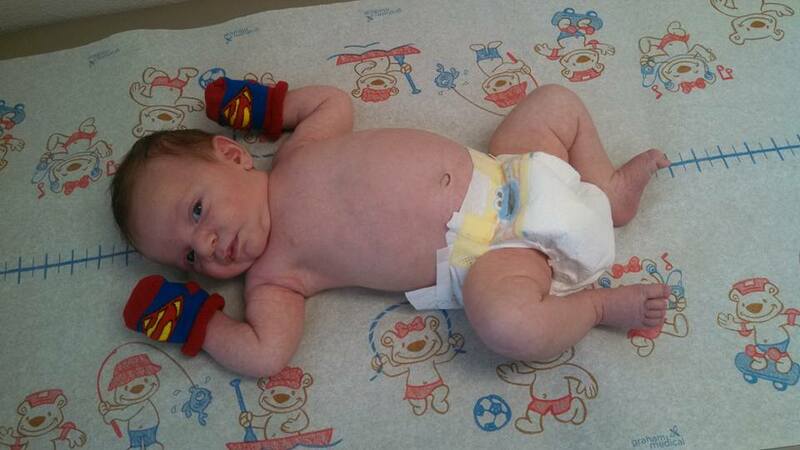 Stats: 2 feet 11 inches tall (95th percentile) and 26 pounds (50th percentile). Favorites: She is all about Paw Patrol right now. She has the whole collection (almost) and she sits and plays with them and has them talk to each other and drive around. 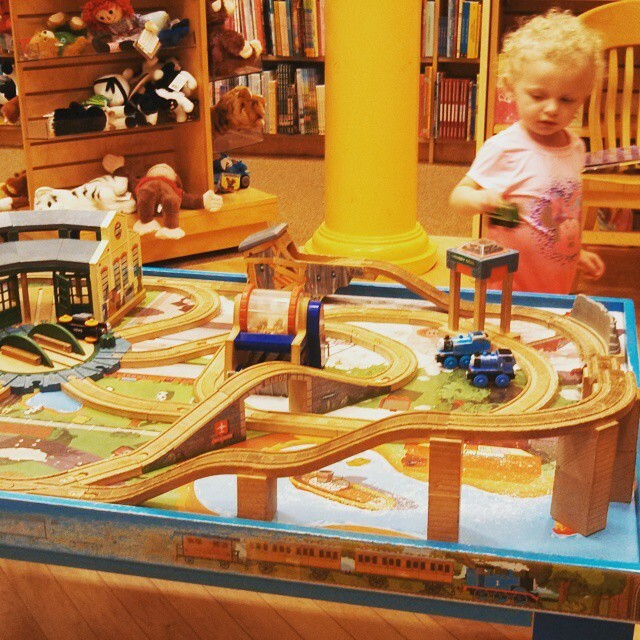 She lines them up on the coffee table and then switches them around to drive different cars. She loves to watch the cartoon as she plays and then acts out what is going on. She loves her classes a lot now. 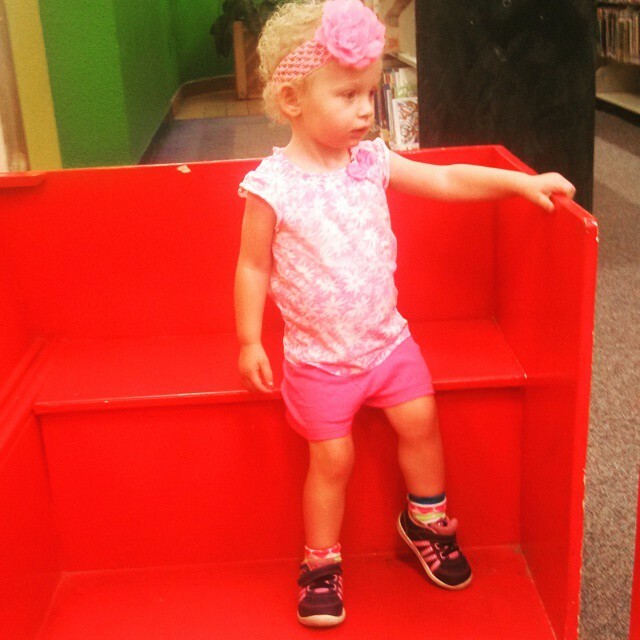 She is getting better at tumbling at the gym and singing along to songs at story time. She is all about going on a field trip somewhere. Every morning she is asking me when we are going “Bye Bye”. It’s sad that she knows the word “Walmart” and says it a lot. Lifesavers for Mom and Dad: For her birthday, she got a bunch of toys and stickers that have been awesome forms of entertainment for her, especially at church. Grandma Coleman taught her to play out back while we worked on the yard, so that has helped when I am doing chores. She loves to lay on our bean bag too and chill out with her new blanket that Grandma Barrow made for her. Dislikes: She will not say the word “please”. I repeat it so much throughout the day and even pair it with “thank you” and she will say thank you but not that. Why does she dislike that word??? It is a constant battle. She is super impatient when a toy is not working and does not want me to help her. She doesn’t like it when I get to her level and say NO when she hits or throws. Facts: She can count to ten all by herself and can name the numbers out-of-order if we switch them up. She knows about half of her alphabet letters, but will not even try the colors. Mike got her to say “red” the other day and she knew what colors her blocks were , but she doesn’t seem to want to go any further on that. 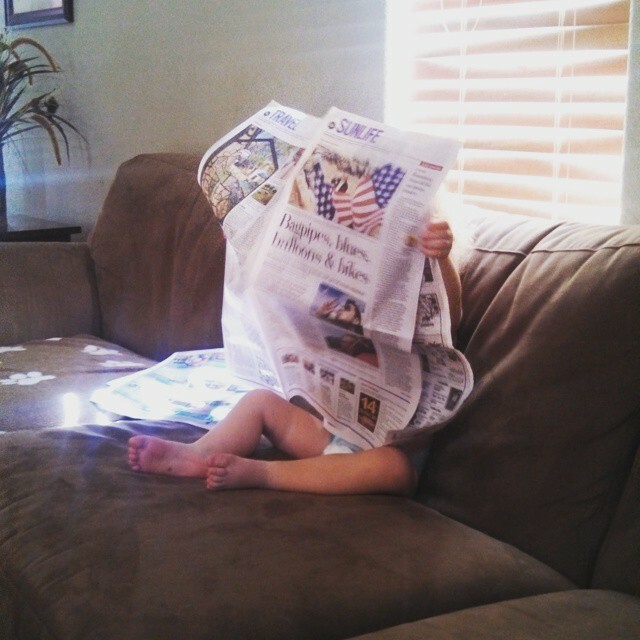 She loves to mimic and mock us now, so I will look over and she will be sitting exactly like I am, she will fold her arms and close her eyes for prayers, she started yelling out “Mike!” when I am yelling for Mike across the house. We need to be careful! Sleep Habits: She was doing so awesome and then…I feel like she went through a growth spurt or something because she is now not sleeping through the night. She keeps screaming for water, her blanket, for me…anything to try to get me to come in the room. It’s so crazy how it just started up. Doctors Visits: Just her two-year old check up. 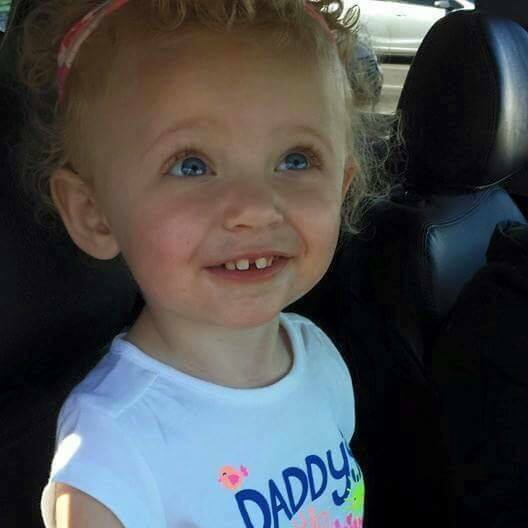 She was sick that day so we were able to get some antibiotics and it was gone in three days. We have been laying low so that we can hang around Mike as much as possible. We have a dentist visit coming up too. I’m curious what he/she says about her famous gap. Eating Habits: Definitely the worst it has ever been. She is so hit or miss. She will eat breakfast and lunch, but then not dinner, but then will want to drink two glasses of milk. But then the next day she won’t want breakfast, but will have a huge dinner. It’s weird and from what I have been reading, totally normal. I started giving her vitamins to make me feel better about her nutrition. The doctor says that her stats look good so not to worry, but I am up at night reading everything about it and stressing! Milestones: Officially counting to ten, walks up the stairs by herself, starting to learn the idea of a balance bike, waters my plants for me, feeds Barney for me, can identify many letters of the alphabet, sings and plays along to the stories and songs at story time, helps me clean up the blankets and pillows around the house, talking a lot more (unfortunately she is super shy, so it is mainly at home)….she is going to be a great help with the baby! Looking Forward To: Seeing how she reacts when the little guy comes home from the hospital! A friend of mine is training for a 5k in February and she texted me the other day to ask me what I used to keep me motivated to run. 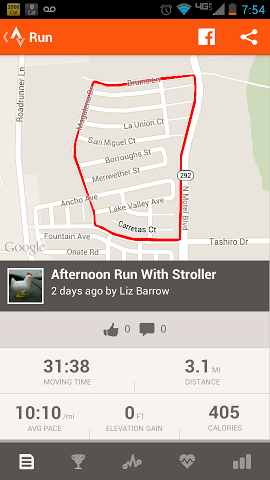 I know most people like to use Map My Run, which I have nothing against, but I really found an awesome app to use. 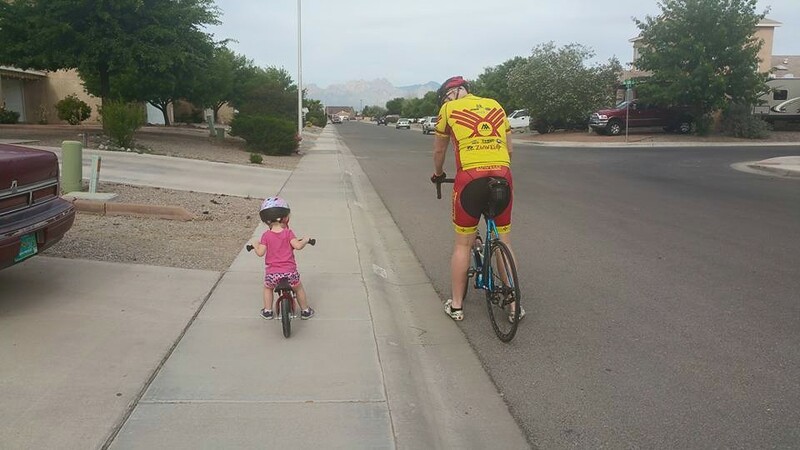 I immediately told her to download Strava Run (and for you bikers out there, Strava Bike). My husband and I are very competitive people and like to have goals to achieve whether it is going against other people or even ourselves. Mike was the one to show me this app and now I am hooked! The best thing about Strava Run is that it pretty much is going against yourself (unless you find a course that someone else has run and documented). In my case, my neighborhood has a perfect loop that you can run a perfect 5k. I run this about once or twice a week and it will tell me whether I beat any previous records I set. Mike likes to run a loop at NMSU where other runners have recorded their times, so he can see his records along with others. I like how it shows how my pace was (I was running with the stroller this day) and how I started off faster and then got slower with my pace. 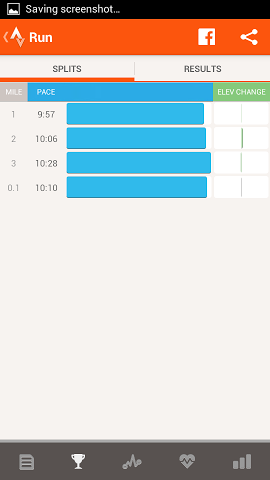 That tells me that I need to pick up the pace at mile 2 and 3. When you finish a run, it will show your overall pace, calorie burn, elevation gain, and moving time. The moving time is especially good for those times you are standing at the beginning trying to get the music started on your headphones. Here’s where the competitive part comes in. 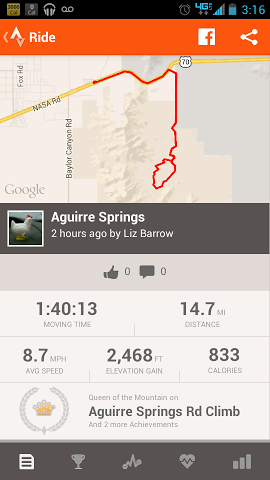 On this particular bike ride, I noticed I had a Queen of the Mountain when I was done. This means that the people who rode before me had a slower time. You then click on the trophy and it will tell you the time you did it in and the other times of the other riders. 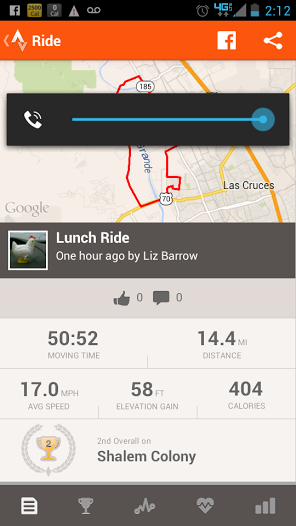 You can add friends (and enemies..hehe) and see an activity feed of their rides. I love looking at what other people did to keep me motivated! You should try it out! It’s really a great app!